Why do European artisan breads taste better? The most important thing besides your recipe is the way the dough is handled. Used for decades in European-style bakeries, spiral mixers can imitate hand-kneading and rolling motions by gently moving the bowl and agitator at the same time. The dough stays cooler, mixes in about half the time of a planetary mixer and has better consistency and texture. American eagle spiral mixers meet every baker’s challenge: High-capacity, high-efficiency machines at an affordable price. Their exceptional reliability make it ideal for busy cooks by decreasing mixing times and maintenance. 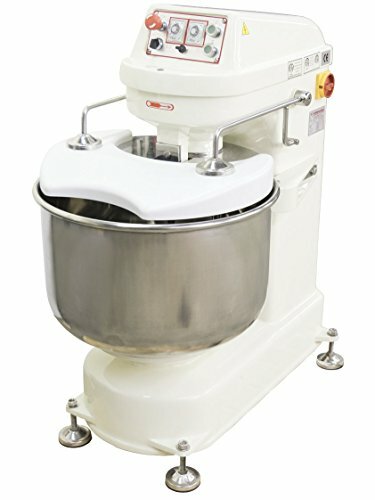 This mixer can handle 66lbs of flour or 110lbs of dough and features an 80 quart bowl, enabling you to make a variety of soft or hard dough used in everything from bagels to pizza. Rest assured that your dough will be mixed to perfection! A simple control panel design requires minimal training to use and features an emergency stop switch, push button start, dual 30 minute timers that can automatically switch the agitator between low (138 rpm) and high (276 rpm) speed and a 3-mode switch that controls the reversible mixing bowl (clockwise, stop, counter-clockwise). The safety guard has to be down to turn on the machine and automatically turns machine off if lifted. The safety guard also features a convenient opening in the front for adding ingredients while mixing. The machine is very heavy duty with unimold cast iron body construction. The heat treated enamel coating and stainless steel bowl also make it easy to clean and wipe down at the end of the day. Other features include castors for ease of mobility and a motor startup relay that gradually spins up the motor, reducing torque on the belts and increasing their useful life. Covered by a 1 year limited warranty. Note: Professional electrician highly recommended to help install the correct power supply line and plug in accordance to local regulations and codes. Machine uses 220V/60hz/3phase power. Manufacturer: American Eagle Food Machinery, Inc. Publisher: American Eagle Food Machinery, Inc. Studio: American Eagle Food Machinery, Inc.